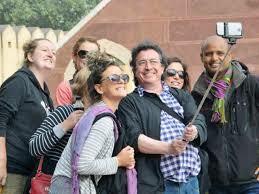 Some 1,600 overseas tourists are dropping in India to witness the impending Lok Sabha elections. The excitement around elections in the country is not restricted to Indians. ‘Election tourism’ is attracting people from other countries visiting India to see how the world’s largest democracy votes. The south of India, however, appears to hold little attraction to such tourists. Even Karnataka, which is in the spotlight for becoming the working model for the ‘Mahagathbandhan’, with its Congress–JD(S) coalition government, has failed to generate much interest. The concept of election tourism started with the Gujarat Assembly elections in 2012. This time, some 1,600 tourists from countries like the U.S., Japan, the UAE, France, Canada, Germany, Australia, and Kenya have arrived in India to witness the unfolding of the Lok Sabha elections. This ranges from people with journalism or political backgrounds to those simply interested in tourism. A majority of the bookings are for Varanasi — from where Prime Minister Narendra Modi is seeking a re-election. Lucknow, Jaipur, New Delhi, Ahmedabad, and Mumbai are also popular. The tours cost between $500 and $1,400. The Indian Prime Minister is a major draw for foreign tourists owing to his “global image”, followed only by Congress President Rahul Gandhi. In comparison, only two south Indian destinations have attracted some tourists: Karnataka — Bengaluru, in particular, and Kerala. Kerala has generated 28 enquiries in recent times, some of which can be attributed to Mr. Gandhi’s decision to contest from Wayanad.